In 2000, an earthquake hits California breaking off a large portion of the state. Due to overwhelming flooding, the parts of California from Anaheim to Malibu is turned into an island. The presidential candidate at the time took this as a sign of retribution for a city that had been full of sin. After his election, he changes the Constitution to make his term permanent. His new policies involve banning anything he considers immoral like tobacco, red meat, alcohol and profanity. Anyone violating his moral codes will be sent to the new Los Angeles Island. Armed guards, high containment walls and watchtowers on the U. S. side keep inmates on the prison island. They have the choice of dying by their own hand if they decide not to be deported to the island. In 2013, the president's daughter steals a remote that will control satellites able to destroy electronics around the world. She escapes to join Cuervo Jones on the island. 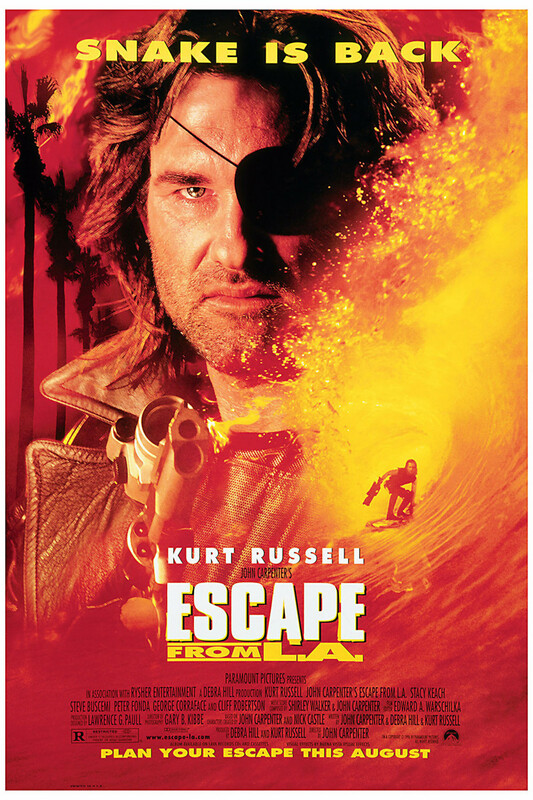 At the same time, Snake Plissken is arrested for a series of immoral crimes. At his scheduled deportation, the president orders him to be infected with a toxin that will kill him in 10 hours if he doesn't receive the antidote. He must save the president's daughter, the remote and return to California, or he'll die on Los Angeles Island.